Hey pollsters . . .
Thread: Hey pollsters . . . I have no skills in this area at all, but it would be interesting to poll the crew on what produced minis, WWI and second poll on WWII are most sought? Any poll miesters out there? Might be a guide for a demand based reprint? Well Dave the SE 5a, Sopwith Pup & BE 2 must be right up at the Top of that list. And the Heinkel HE 111. I was thinking already released minis . . . sorry. I'm surprised the P-40 hasn't gotten a second go-round. So many different liveries from multiple theaters are possible....not to mention it sold out faster than any other WW2 model and I don't think it's even close. David, the S.E.5a was released by Nexus. D.H.2's and the Messerschmitt Bf-109E's of Adolf Galland and Werner Molders are also well sought after. EIIIs and DH 2s please. Love to finally have some early war stuff. I will probably think of others. The first squadron to be equipped entirely with the F.E.2 was 20 Squadron, deploying to France on 23 January 1916. At this stage it served as a fighter-reconnaissance aircraft – eventually about ⅔ of the F.E.2s were built as fighters (816) and ⅓ as bombers (395). The F.E.2b and F.E.2d variants remained in day operations well into 1917, while the "b" continued as a standard night bomber until August 1918. At its peak, the F.E.2b equipped 16 RFC squadrons in France and six Home Defense squadrons in England. On 18 June 1916, German flying ace Max Immelmann was killed in combat with F.E.2bs of No. 25 Squadron RFC. The squadron claimed the kill, but the German version of the encounter is either that Immelmann's Fokker Eindecker broke up after his synchronizer gear failed and he shot off his own propeller, or that he was hit by friendly fire from German anti-aircraft guns. In any case, by this time the F.E.2b was at least encountering the German monoplane fighters on more or less even terms and the so-called "Fokker scourge" had ended. In combat with single-seater fighters, the pilots of F.E.2b and F.E.2d fighters would form what was probably the first use of what later became known as a Lufbery circle (defensive circle). In the case of the F.E.2, the intention was that the gunner of each aircraft could cover the blind spot under the tail of his neighbour and several gunners could fire on any enemy attacking the group. On occasion formations of F.E.2s fought their way back from far over the lines, while under heavy attack from German fighters, using this tactic. Although outclassed as a day fighter, the F.E.2 proved very suitable for use at night and was used as a night fighter in home defense squadrons on anti-Zeppelin patrols and as a light tactical night bomber. It was first used as a night bomber in November 1916, with the first specialist F.E.2b night bomber squadrons being formed in February 1917. 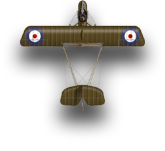 F.E.2bs were used as night bombers in eight bomber squadrons until the end of the First World War, with up to 860 being converted to, or built as bombers. Service as a night fighter was less successful, owing to the type's poor climb and ceiling. Last edited by flash; 11-08-2018 at 11:36. Quite right Mike but this Poll is about what Nexus/Ares have produced that you can't find rather than a series 10 wish list - that's a subject for another Poll. They are as rare as Hens teeth. WWII A6M2's, Wildcats, P40's (Boyington? ), Val, FW190, P51, HE111 BoB markings.